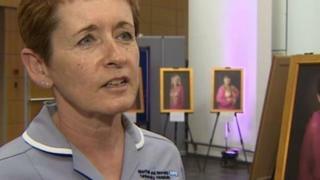 Fifty portraits of women showing their breasts following cancer treatment are being exhibited at Norfolk and Norwich University Hospital. Femininity Comes From Within depicts women after having a mastectomy and following breast reconstruction. Model Margaret Howe said she hoped it would give other women confidence in the "fantastic job" done by surgeons. Photographer Julia Holland's project for charity Keep Abreast began two years ago and is ongoing. Ms Howe, who is also a health care assistant working in plastic surgery at the hospital, has been diagnosed with breast cancer twice and underwent a second reconstruction in 2009. She said she wanted to be photographed as so many patients had told her they had lost their femininity after a mastectomy. "I don't think they have. There is more to us than just our breasts," she added. "I'm passionate that the ladies still feel like a woman, still feel feminine, going through that journey having their breasts reconstructed." Speaking about the portraits, she said: "They all look so beautiful and happy and feminine. "It's a huge message to send out to ladies who are going to go through this quite traumatic time." Mum-to-be Adele Wood, 26, visited the exhibition on Monday and said she hoped to sit for Ms Holland. She had just discovered she was pregnant when she was diagnosed with breast cancer. She underwent a mastectomy at 12 weeks and at 30 weeks pregnant is about to finish her chemotherapy. She said the exhibition made her realise the advances in breast reconstruction surgery, which she hopes to have next year after the birth of her son. "I'm having [photographs] of the bump and the scar, the baby and the scar and the baby and the reconstruction, so I can show him when he's older what we went through together. "I just plan on taking photos and videos of everything." The exhibition in the east atrium at the Norfolk and Norwich University Hospital ends on Thursday.